Now that we are in the heat of summer (and afternoon thunderstorms), during the day we often need something cold to refresh us. What's better than popsicles for that task? And even better, you can make them at home! I have great memories of having homemade popsicles when I was growing up. It was always so fun to choose the flavor and then, ooohh, even mix and match sometimes! :) Like mixing lemonade koolaid with lime jello, yummers! I also remember MAKING these as a kid, it is a very easy, kid friendly recipe! 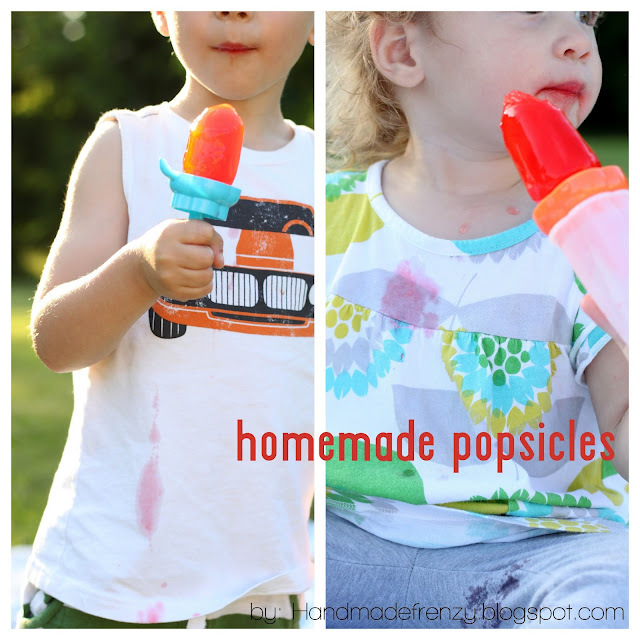 All you need is 3 inexpensive ingredients and popsicle molds and you are in business! One batch makes approximately 12 - 14 popsicles, depending on the size of your molds. Oh summer, how I love thee! Mix jello, koolaid and sugar together in a pitcher. Stir in hot water until dissolved. Add cold water and stir. Pour into popsicle molds and freeze until solid.